The article on online censorship by Subhashish Panigrahi was published in Global Voices on January 6, 2015. Click to view the article on Global Voices here. The Government of India in the last week of 2014 asked Internet service providers (ISPs) to block 32 websites including code repository Github, video streaming sites Vimeo and Dailymotion, online archive Internet Archive, free software hosting site Sourceforge and many other websites on the basis of hosting anti-India content from the violent extremist group known as ISIS. 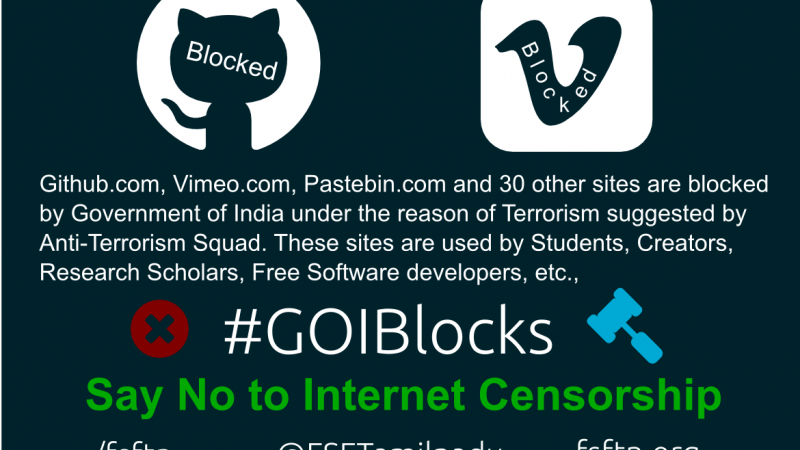 The blanket block on many resourceful sites has been heavily criticized on social media and blogs by reviving the hashtag #GoIblocks that evolved in the past against internet censorship by the government. Typically, users are not informed about which websites are blocked, so this was a welcome move from the ISP. In 2012, opposition party leader Narendra Modi (who is now India's Prime Minister) tweeted against the URL blocks by the earlier ruling of India's National Congress when then-Minister of Communications and Information Technology Kapil Sibal ordered to block 300 websites. Many eyebrows were raised when Modi repeated the move this time around. Internet censorship in India has been increasingly prominent since 1999 when Pakistani newspaper Dawn was blocked by the Videsh Sanchar Nigam Limited for post-Kargil War views against India. These caught heavy criticism from netizens, often under the hashtag #IdiotKapilSibal. Since then there have been many instances of government-mediated censorship, particularly with the enactment of India's Information Technology Act of 2000. Arvind Gupta, head of Information Technology for India's ruling Bharatiya Janata Party, tweeted to clarify that the sites were blocked as advised by the Anti-Terrorism Squad. After agreeing to remove anti-India content posted by accounts that appeared to have some association with ISIS, weebly.com, vimeo.com, Pastebin, dailymotion.com and gist.github.com were unblocked. These websites have undertaken not to allow pasting of such propaganda information on their website and also work with the government to remove such material as per the compliance with the laws of land.